Introducing the Alpha Juno Programmer, our new programmer panel overlay for the low-cost Behringer BCR-2000 MIDI desktop controller. 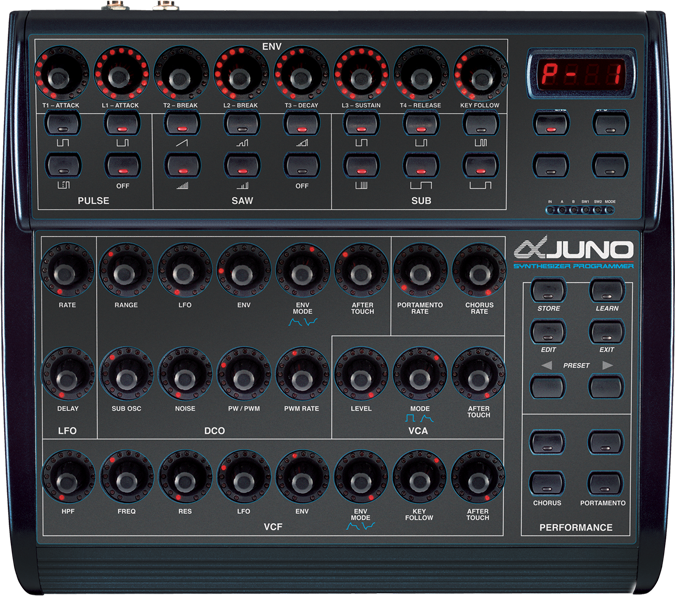 You can now access ALL the sound editing parameters hidden inside your Juno-1, 2 and MKS-50. Includes SysEx template file, no programming required. Click Here to Download SysEx File. Getting professional results is pretty easy given the exceptional strength of the overlay and the highly accurate panel cut-outs in the design. Thumbs up! I installed the Juno version of the overlay and it took me less than 10 minutes. It is an extremely well made overlay and if you follow the instructions it goes on perfectly. I highly recommend it. We just got the Kiwi-106 Overlays, and they look great! I have to say I am impressed. Very nice work and quality indeed. I like the Jupiter version and it is a nice look. Different but still Roland. NOTE: US order are shipped 2-day USPS Priority Mail. All non US orders are shipped 6-10 day Priority International and shipping time varies, please contact us for faster services. We are in no way affiliated with the Roland or Korg name, logo, or other companies referred to on this site. All logos and trademarks on this site are property of their respective owner.